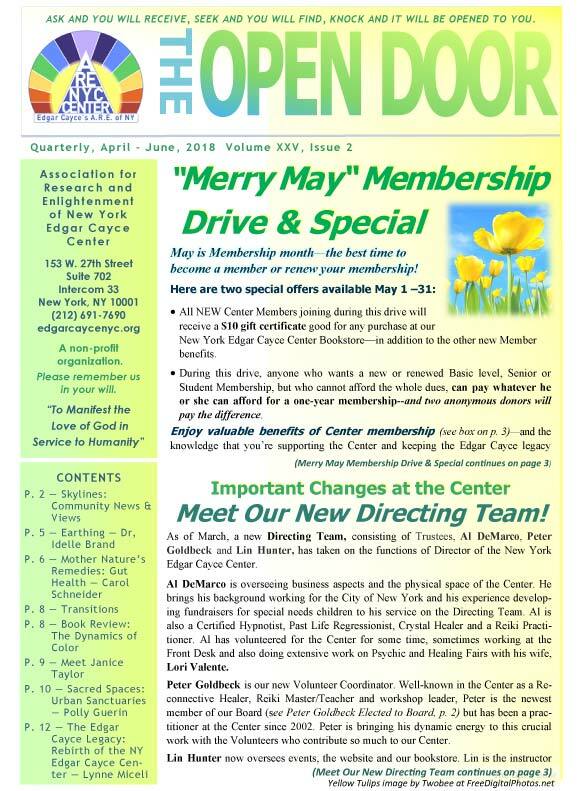 Apr-Jun 2018 Open Door Newsletter: Merry May Membership Specials & Gift in the new Open Door! Plus - Earth as a Healer; Gut Health; Sacred Spaces in NYC -- & more! Jan-Mar 2018 Open Door Newsletter: A New/Ancient Medicine, A Life in La Resistance, Labyrinths in NYC, Remembering Two A.R.E. “Greats,” Special Thanks & More! Oct-Dec 2017 Open Door Newsletter: A True Ghost Tale, Building for Our Next 20 Years, A Lesson from the Civil War, Sacred Spaces in NYC—and More! 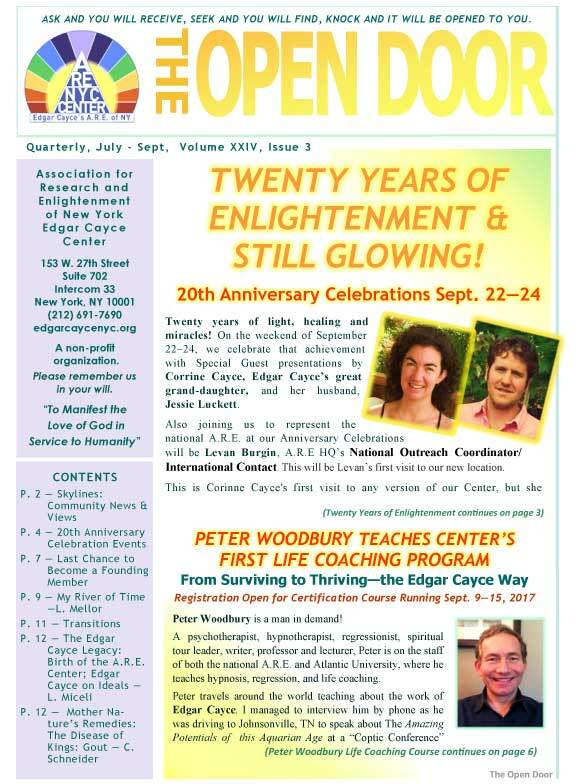 July-Sept 2017 Open Door Newsletter: 20th Anniversary News, Peter Woodbury - Life Coaching Teacher & “Bridge Person”, Natural Healing & so much more! April-June 2017 Open Door Newsletter: Now for Blooming Membership Specials, Natural Remedies, a Past Life in pre-Revolutionary Boston – and more! Our Spring Membership Drive and Special starts today! 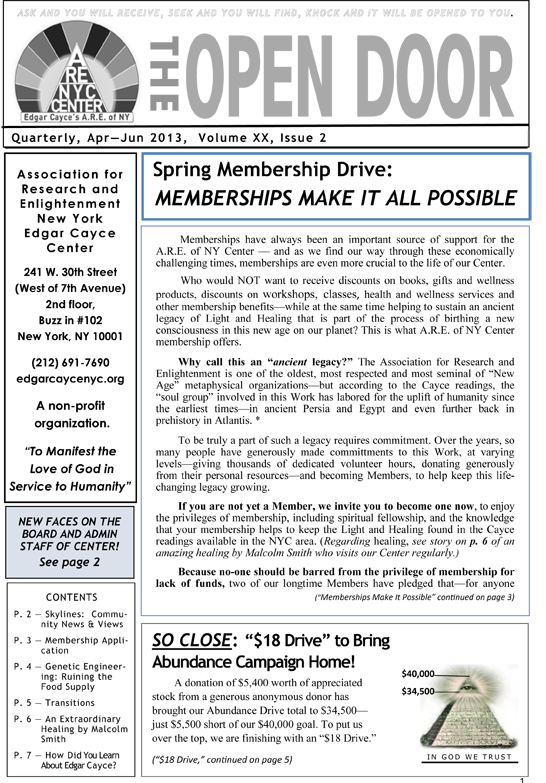 Now through June is the best time to join or renew your NYC Center Membership!" All NEW Members who join will receive a $10 gift certificate good for any purchase at our New York Edgar Cayce Center Bookstore. Sign up for a two- or three-year membership and save up to $30! Anyone who wants to become a Basic level, Senior or Student Member but who cannot afford the whole Membership dues, can pay whatever he or she can afford--and two anonymous donors will pay the difference. 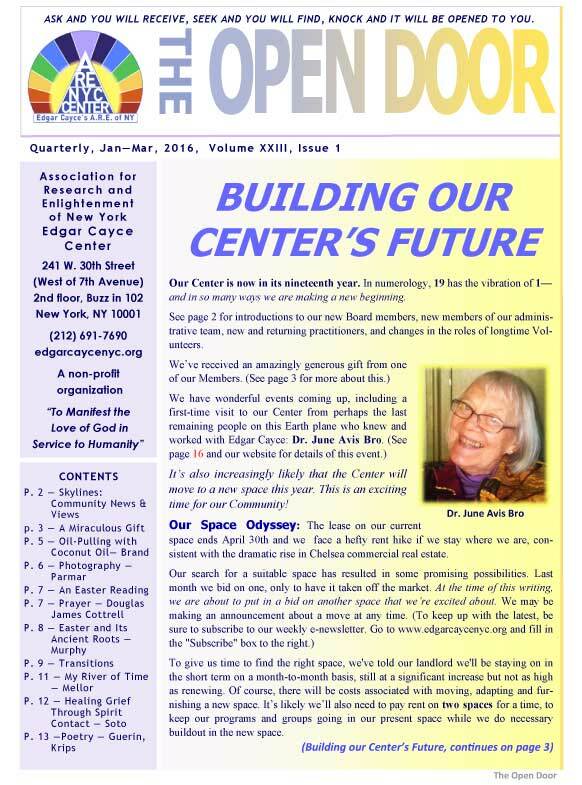 Read all the details in the Spring issue of The Open Door, quarterly newsletter of the Center. Become a Member online now!—or download this form. Let laughter be the only thing you can’t hold in! Mother Nature’s Remedies shares a natural approach to urinary incontinence. The Dentist’s Office of Destiny – why A.R.E. folks in NYC in the 40’s loved going to that dentist’s office. As always, we hope you enjoy this issue. We welcome your comments and suggestions. Discounts on most workshops and classes and on many health/wellness or intuitive services. AND-- DURING OUR MAY-JUNE DRIVE, for new Members--a $10 Gift Certificate for use in our Bookstore! 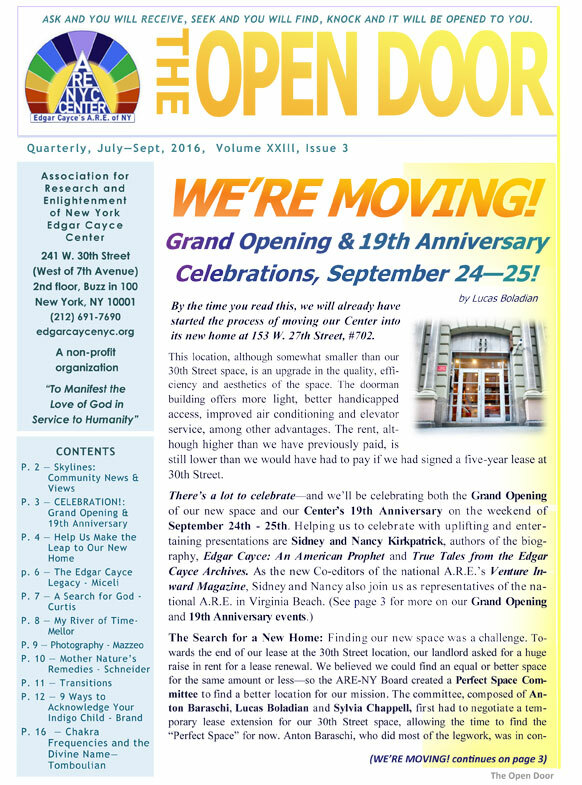 The new issue of The Open Door (TOD) is packed with news, holistic health info and inspiration. 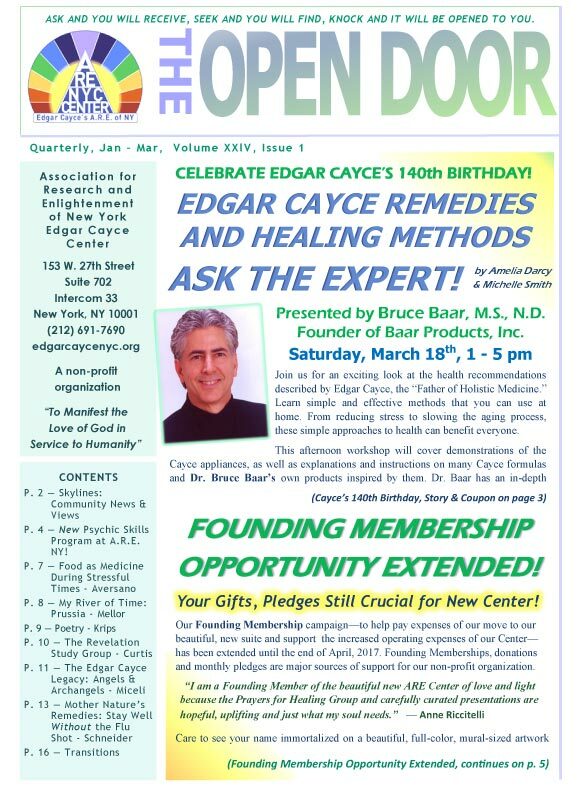 Healing with Cayce remedies from the man who makes them, Dr. Bruce Baar. Come to his workshop on March 18, Edgar Cayce’s 140th Birthday. $5 Workshop Coupon, page 3. Register by March 13 for bigger savings! Groundbreaking new Psychic Skills Course starts in April! Meet our new teachers! Convenient new weekend format. Oct-Dec 2016 Open Door Newsletter: Miracle on 27th Street!, an Urgent Request, a Ghostly Encounter, Helping Loved Ones to Transition, and more! Cultures throughout the world regard this season as the time of year when the veil between this world and "the other side" is thinnest—a time to honor the mysteries of life and death. 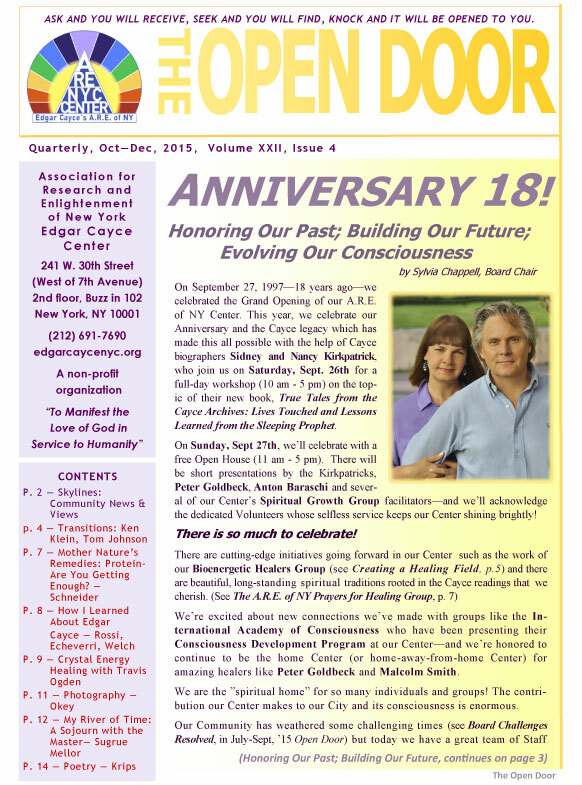 As it happens, the theme that emerged for this Fall issue of The Open Door, quarterly newsletter of the A.R.E. of NY Community, is the afterlife, the continuity of Life—and that for the soul, there is no death! A Miracle on 27th Street! Lessons learned from the dying—and much more. Are you interested in writing for The Open Door? Send your ideas for articles or stories to me at the above e-mail address. You can also submit original poetry, photography or artwork. Thank you—and we wish you a glorious Autumn! Jul-Sept 2016 Open Door Newsletter: Open now for Making the Leap! Christ Consciousness, a healing oil, the Indigo Child, Sounding Divine, more! This is it! We’re making the leap to our new space! 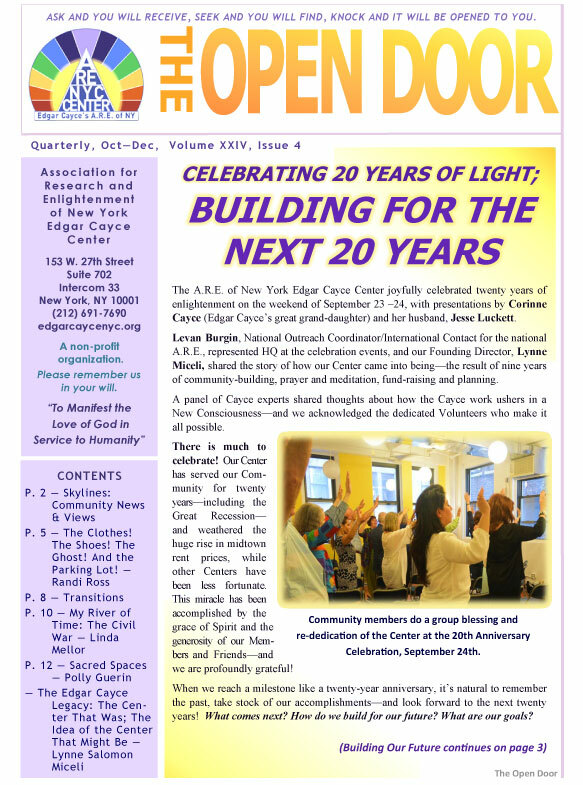 Read about it in the new issue of The Open Door, quarterly newsletter of the A.R.E. of New York Edgar Cayce Center. 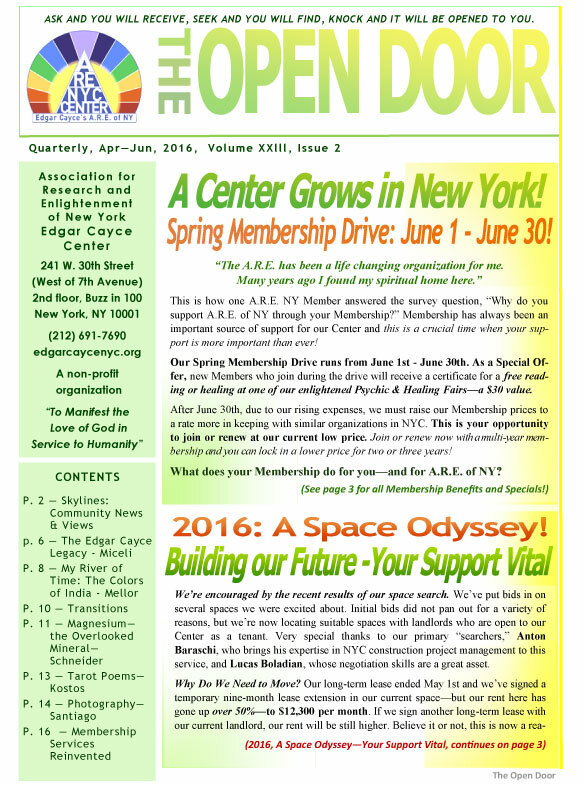 Apr-Jun 2016 Open Door Newsletter: Membership Special Offer, Our Space Odyssey & You,The Cayce Movie? Holistic Remedies—and More! 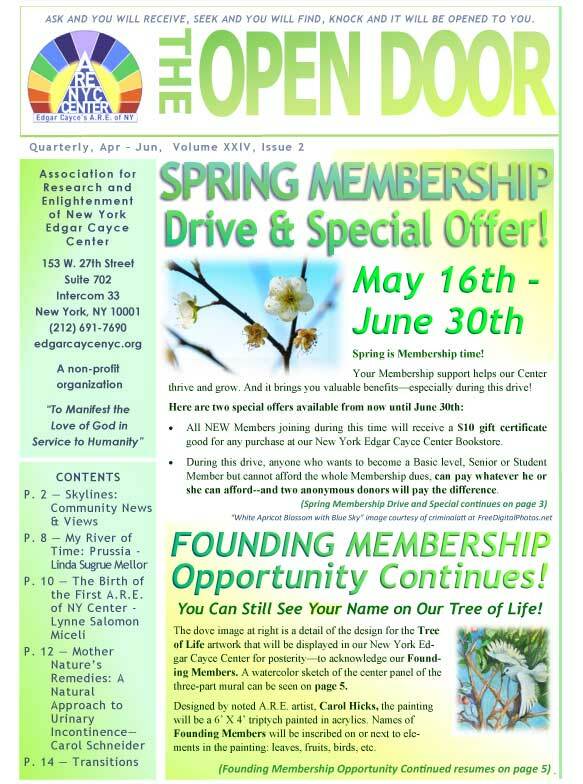 The Spring issue of The Open Door, quarterly newsletter of the New York Edgar Cayce Center, is now online here. There’s important news! Jan-Mar 2016 Open Door Newsletter: Space Search Update, A Miraculous Gift from the Other Side, Natural Remedies, Life in the Iron Age--and More! There's photography, poetry and more! We hope you enjoy this issue, and as always, we welcome your comments and suggestions. Remember to turn your clock ahead tonight--and have a glorious Spring! 18 Years! —Celebrating our Center & Community, then and now! “Gut Health” and Your Brain. Who knew? Hope you enjoy this issue. Want to contribute to The Open Door? July-Aug 2015 Open Door newsletter: Board Challenges & Changes, Our Vision, Crystal Energy, Walking with the Master, Natural remedies – and more! The Summer Issue of The Open Door is now online for your reading pleasure. Challenges, Changes, New Leadership and a Vision for our A.R.E. NY Board & Center! Remembrances of two Greats: Ken Klein, one of the founders of the A.R.E. of NY Center & Tom Johnson, founder of The Heritage Store. We welcome Letters to the Editor: Share your visions, ideals, inspirations, comments, criticisms, questions, opinions or suggestions—or submit a poem, artwork or a photograph for the Fall Open Door. April-June 2015 issue of The Open Door—read now! 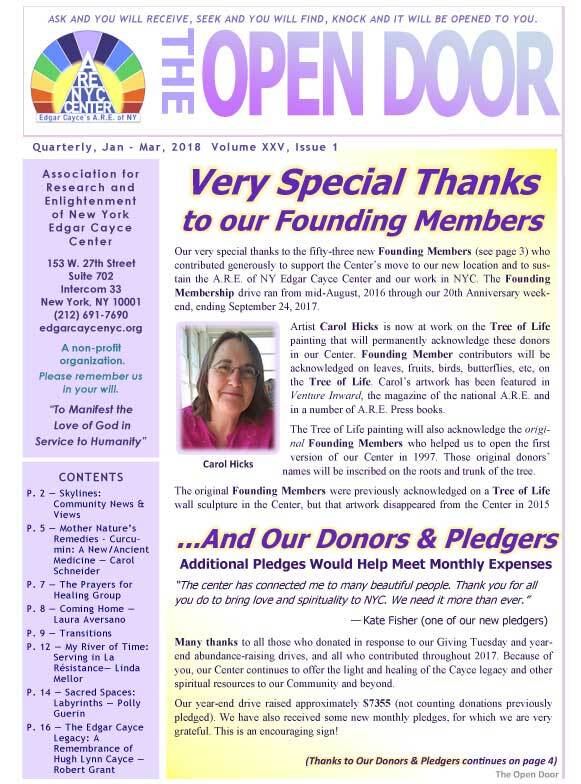 This long-awaited Spring brings the latest issue of The Open Door, quarterly newsletter of the A.R.E. of New York Community! Iodine: Why you can’t live without it. How to know if you’re getting enough. Creating Our Dream fundraising update & an exciting benefit event: Waking Up in 5D. A past-life memory: Becoming a priestess in ancient Greece. You can give to your favorite cause painlessly--just by surfing the Net or shopping online! Jan-Mar 2015 issue of The Open Door—read now! 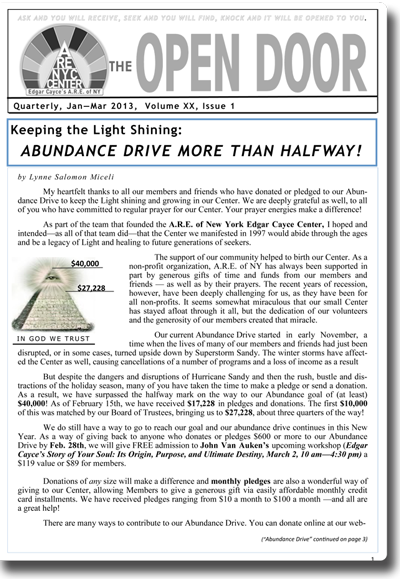 “Hot off the presses,” here’s the Jan – Mar issue of The Open Door, quarterly newsletter of the A.R.E. of NY Community. We’re working together to Create the Center of Our Dreams! See the front page update! If life gives you lemons, you’re lucky! Learn about the extraordinary health benefits of this common fruit in Mother Nature’s Remedies. “Power animals,” “soul retrieval,” and unconditional love—they’re all key ingredients of Rob Murphy’s shamanic practice. Cynthia Fellowes shares how Rob became an American shaman. Linda Sugrue Mellor continues her memoir of a soul’s journey in A Caravan from Persia. How can you benefit the causes you love after you’ve left this dimension? Maureen St. Germain explains Planned Giving. 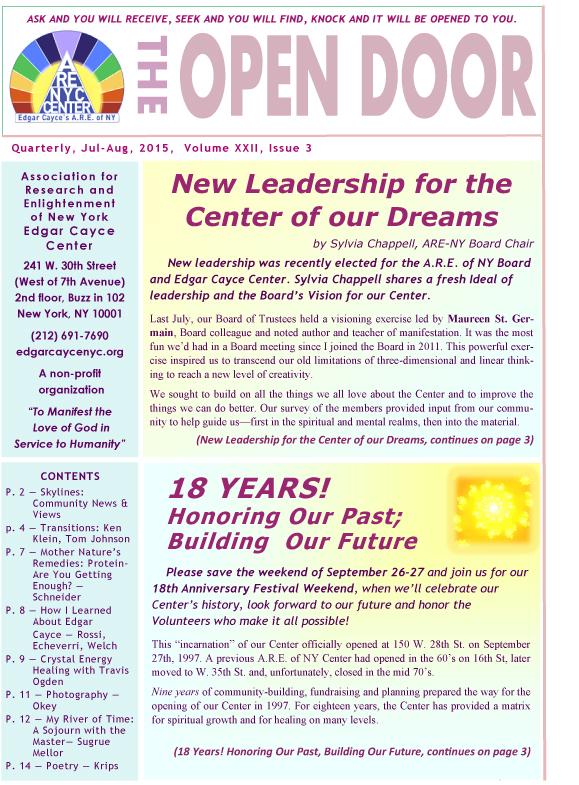 The Open Door, quarterly newsletter of A.R.E. of NY is here! We hope you enjoy this issue and we appreciate your comments and suggestions. 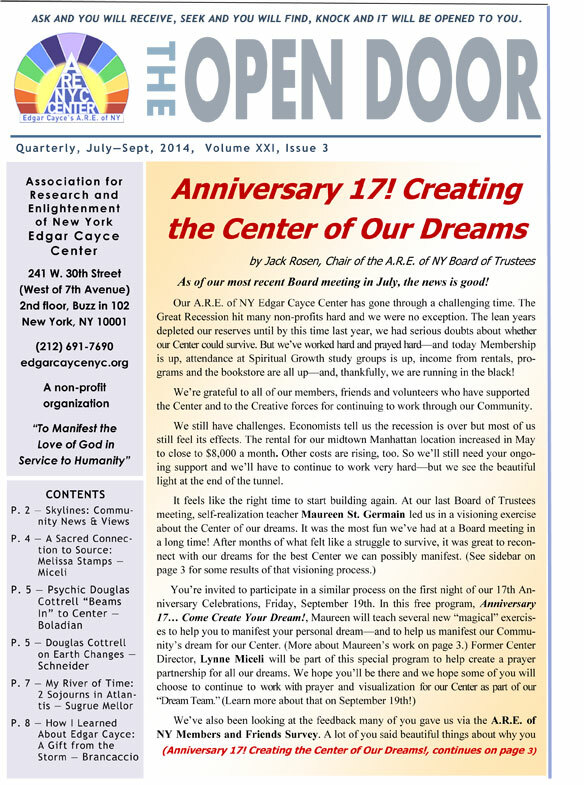 The 17th Anniversary issue of The Open Door, quarterly newsletter of A.R.E. of NY is here! Anniversary 17! Creating the Center of Our Dreams -- Visioning and planning for the future of our Center...Your inspirations welcome! Douglas Cottrell on Earth Changes – This is a troubling vision and we welcome your comments, discussion and alternate visions. And in A Gift from the Storm, Nick Brancaccio tells how another act of God – Hurricane Sandy – brought light to his life. We hope you enjoy The Open Door and, as always, we welcome your comments and suggestions. Read the latest OPEN DOOR Newsletter (Apr-Jun 2014) now! The Spring issue of the Open Door (our quarterly newsletter) is now available here. What’s it like to have a private reading with Douglas James Cottrell, the psychic who some call an “Edgar Cayce for our time”? Jack Rosen describes his experience in this issue. Did you know? 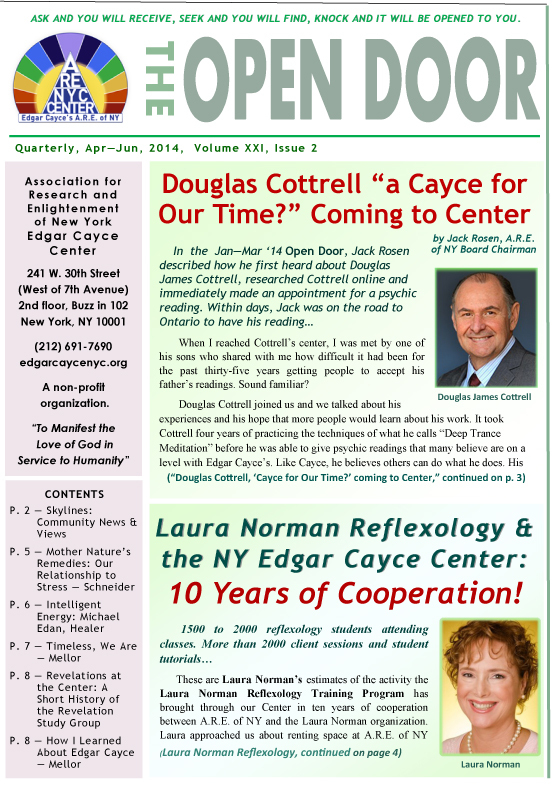 The Laura Norman Reflexology Training has been based at the NY Edgar Cayce Center for ten years. They’re celebrating -- by offering a gift to you! Stress! What causes it and what can you do about it? Carol Schneider’s Mother Nature’s Remedies column gives some helpful pointers. Also in this issue, the first in a series of past-life visions by Linda Mellor: Timeless, We Are – and more! 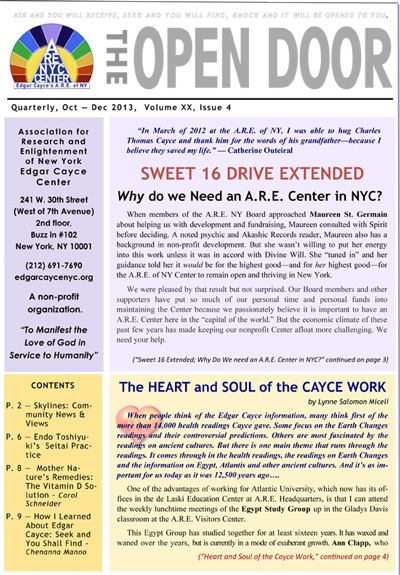 I invite you to read the Oct-Dec 2013 issue of The Open Door, the quarterly newsletter of A.R.E. of New York. As always, we hope you enjoy it and we welcome your comments and suggestions. For this sacred season, this newsletter includes a message from ancient Egypt that is just as meaningful today as it was 12,500 years ago. It also includes an article about our Sweet 16 Fundraising Drive, and here is the latest: Your generous donations have brought us to about half of our goal of $16,000. We hope to reach that goal by December 31st and that means we have 15 days left—so please keep the tax-deductible contributions coming! Donations of any amount make a difference and we are so very grateful to all of you who have given to this drive! Thank you for being a part of this great Work. Read the latest OPEN DOOR Newsletter (Jan-Mar 2014) now! • Did you know… Modern-day mystic, teacher & author Maureen St. Germain is the newest member of the A.R.E. of NY Board of Trustees? Read her interview now. 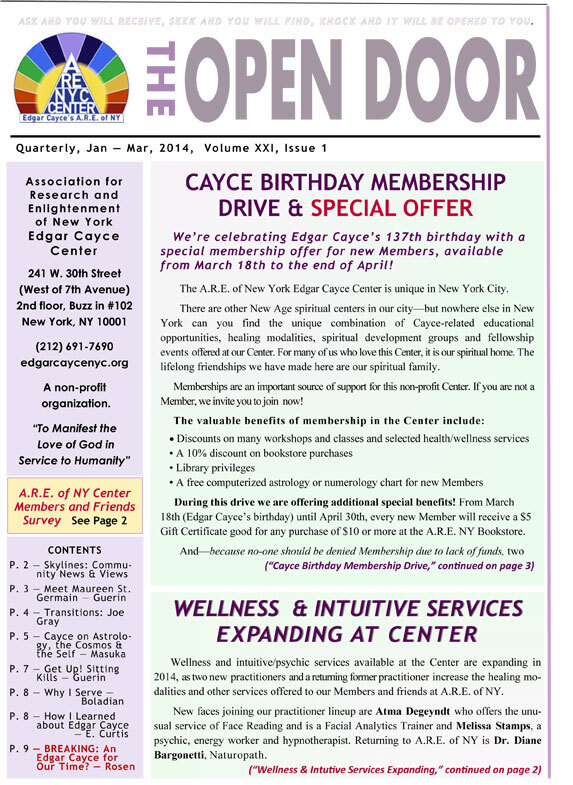 And don’t miss the biggest news—our Cayce Birthday Special Membership Offer! From Edgar Cayce’s birthday, March 18, through April 30, we’re offering a $5 Bookstore Gift Certificate for those joining as New Members. In addition, for any new or renewing Members who cannot afford an annual Membership, generous donors are offering scholarships! 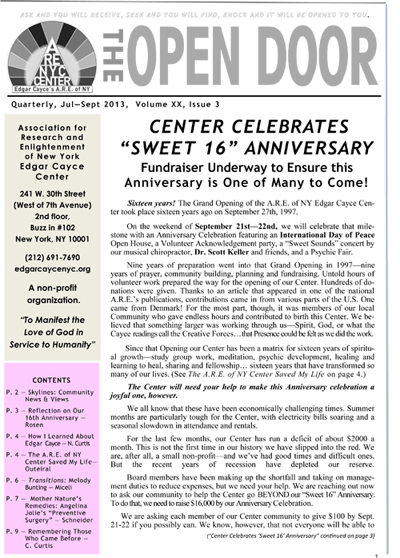 "Hot off the presses," below is a link to our special 16th Anniversary issue of The Open Door newsletter. We hope you enjoy it and we welcome your feedback. Please download and read it now, email it to friends, or print it out for those who don’t get email. As these last weeks of summer merge into Autumn, we are looking forward to our Center's 16th Anniversary and to sharing that occasion with you and all our Members and Friends. Each Anniversary is an opportunity to magnify and celebrate that which is good in our Center and our Community, and to commit to making it still better! Heartfelt thanks to all who have donated to our ongoing Sweet 16 Fundraising initiative and all who support our Community through memberships and volunteer service. Your contributions make the Work of the New York Edgar Cayce Center possible! 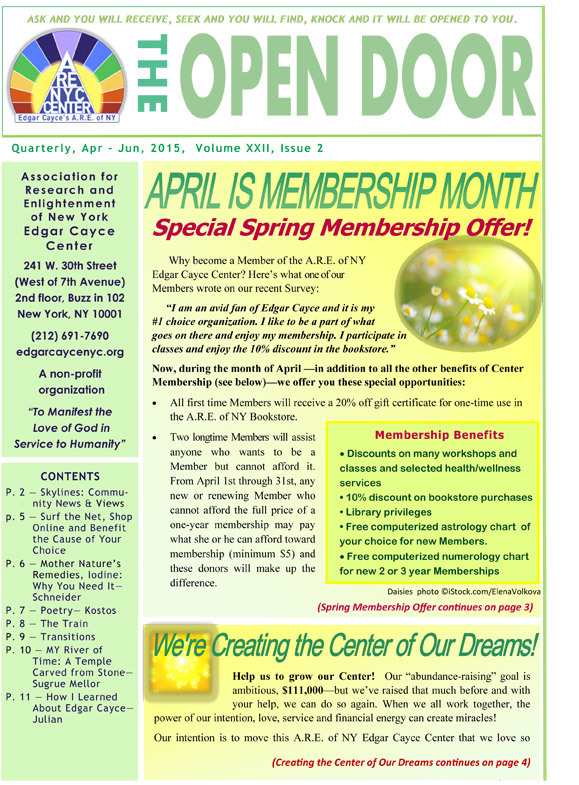 We welcome with open hearts the Spring Open Door, quarterly newsletter of the A.R.E. of NYC, thanks to our Center’s “Guiding Light” Lynne Miceli. Please download our second 2013 issue and read it now, email it to friends, or print it out for those who don’t get email. Soon, printed copies will be available at the Center. THE OPEN DOOR NEWSLETTER REBORN! READ IT NOW! Thanks to our Center’s “Guiding Light” Lynne Miceli who wrote/edited the entire issue. Please download our first 2013 issue and read it now, email it to friends, or print it out for those who don’t get email.